Emotional intelligence is the ability to understand, contain, and monitor own feelings and reactions as well as the ability to monitor, assess, and process feelings of others. Emotional intelligence also includes reading people’s facial expressions, body language, tone of voice, and other obvious and subtle verbal and non-verbal messages. Emotional intelligence is a mostly learned skill and takes years to develop. Emotional intelligence stems from a wide range of skills that children of all ages can develop and improve on. Nurturing child emotional intelligence to develop these skills are critical for emotional well-being and life success. Why is it important to teach kids to be emotionally intelligent? We want our kids to develop emotional intelligence so they acquire a sound judgment of their environment, are able to set proper boundaries with other children and adults, safely express their feelings and are aware and respond properly to other people’s emotions and messages. In a long run it helps kids develop a sense of emotional safety, social competence, empathy, and thus, a better sense of belonging in any social group. What happens if the child lacks emotional intelligence? Teaching emotional intelligence is as important as teaching academics. Kids who lack emotional intelligence frequently suffer from bullying and get excluded from play activities by other kids. They seem being more deprived of healthy group experiences and fall further behind in their social skills. As adults, they seem to manifest with immature and reactive behaviors and tend to have problems with their friends, co-workers, superiors, with their own spouses and kids. When do we start teaching emotional intelligence skills? You can begin talking with your child about emotional intelligence as early as 18 months of age. By age of 4 you should expect to see signs of emotional intelligence such as compassion and sharing. For example your child might be asking, “Are you ok?” if someone’s hurt. Don’t worry, if your child’s has not developed these skills yet. They come very gradually. The key is to be patient and consistent. How can we teach our children emotional intelligence? Give your child ample opportunity to practice. 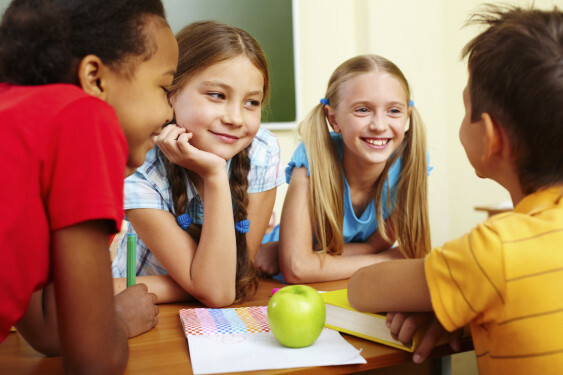 Social interactions teach kids valuable life-long skills. Encourage your child to play with other kids as much as possible. You can start off with short play dates, which have to be monitored, especially with young kids. Don’t force kids to share their toys but discuss taking turns with a toy, “Emily is playing with this toy, as soon as she’s done, you can have your turn. For now, we can play with this toy together.” Encourage young kids to use words to express their emotions during a play date. Older kids benefit from group activities and interactions. Read books which enrich emotional intelligence together with your kids. Introduce your child to the Lots of Feelings book by Shelley Rotner, and learn and practice together to identify various facial expressions. Prompt your child. Say, “Oh, Michelle had a fall and started crying. Let me come to her and ask her whether she is OK. Do you want to come with me?” By doing so you’re encouraging empathy and modeling a proper response to someone who’s hurt. Give yourself a credit. If your child supported Michelle it means you did a wonderful job modeling empathy and emotional intelligence for your child! Be patient. If you model emotional intelligence and your child is still not displaying it, do not rush your child – keep modeling and prompting. Being patient and understanding is a great manifestation of your own emotional intelligence.